Nokia reported Q4 2018 sales of EUR 6.9bn, up 3% year over year compared to EUR 6.7bn in Q4 2017 on both a reported and constant currency basis. Nokia said its top line performance reflects the strong competitiveness across its portfolio and that its strategy execution is tracking well. Rajeev Suri, President and CEO of Nokia, stated: "Looking forward, I expect Nokia’s performance to strengthen for the full year 2019 versus 2018 and our view of a fast and meaningful shift to 5G remains unchanged. Given that 5G rollouts will be staggered over the course of the year, we expect 2019 to have a soft first half followed by a much more robust second half." "Over the longer-term, we expect a virtuous cycle of investment, where operators update their networks across multiple domains – from optical to macro radio, fixed wireless access to cloud core, small cells to IP routing, network agnostic software and more. Following this, we expect a second wave where industrial customers will invest in private wireless technology including LTE and 5G-ready networks. With our end-to-end portfolio, Nokia is well-positioned to tap this extended cycle." 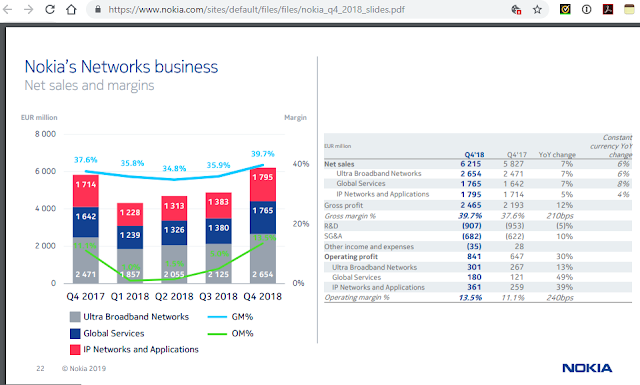 Ultra Broadband Networks net sales increased 7% year-on-year, primarily due to Mobile Networks, which benefitted from growth in radio networks and small cells. On a constant currency basis, Ultra Broadband Networks net sales increased 6%. Global Services net sales increased 7% year-on-year, primarily due to network implementation and, to a lesser extent, systems integration and managed services. On a constant currency basis, Global Services net sales increased 8%. IP Networks and Applications net sales increased 5% year-on-year due to both Nokia Software and IP/Optical Networks, primarily driven by our technology leadership. On a constant currency basis, IP Networks and Applications net sales increased 4%. The increase in IP/Optical Networks net sales was due to IP routing, reflecting strong uptake of our market leading FP4 portfolio, partially offset by optical networks. Despite clear supply chain improvements in the fourth quarter 2018, on a sequential basis, IP routing net sales continued to be adversely affected by some remaining shortages of certain components. The net sales performance in optical networks was solid in the context of a tough year-on-year comparison to a particularly strong fourth quarter 2017, which benefitted from certain large projects in Europe and Middle East & Africa. network software solutions, as well as network management and digital networks. Boosted by 5G commercialization and strong demand for cloud-native solutions, growth was particularly strong in North America, Asia-Pacific and Latin America. In its quarterly financial report, Amazon disclosed that AWS generated sales of $7.43 billion, up 45% over the same period last year, and operating income of $2.177 billion, up 61% year over year. AWS now represents about 10% of Amazon's overall revenue and about 58% of its overall operating income. 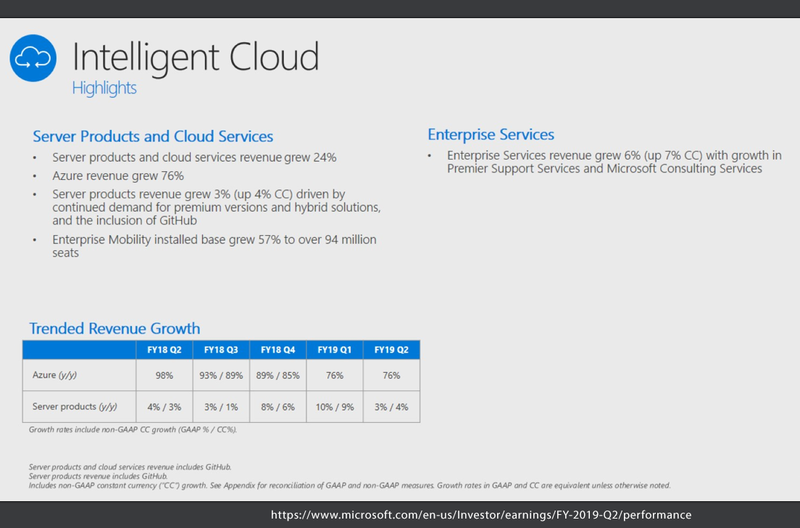 Microsoft posted quarterly revenue of $32.5 billion, up 12% yoy, and operating income of $10.3 billion, up 18% yoy. Net income was $8.4 billion GAAP and $8.6 billion non-GAAP. Intel's board of directors named Robert (Bob) Swan as chief executive officer. Swan, 58, who has been serving as Intel’s interim CEO for seven months and as chief financial officer since 2016, is the seventh CEO in Intel’s 50-year history. Swan has also been elected to Intel’s board of directors. Prior to joining Intel, Swan served as an operating partner at General Atlantic LLC and served on Applied Materials’ board of directors. He previously spent nine years as CFO of eBay Inc., where he is currently a director. Earlier in his career, he was CFO of Electronic Data Systems Corp. and TRW Inc.
Brian Krzanich resigned as Intel's CEO and as a member of its board of directors because of a past consensual relationship with an Intel employee. Intel said it was recently informed of the relationship and that an investigation by internal and external counsel confirmed a violation of Intel’s non-fraternization policy. Intel's board named Chief Financial Officer Robert Swan as interim CEO, effective immediately. Brian Krzanich was named CEO of Intel in May 2013. He served previously as Intel's chief operating officer. Krzanich joined Intel in 1982. 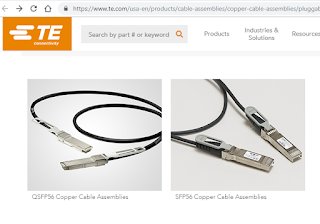 TE Connectivity (TE) introduced a portfolio of 56 Gbps QSFP56 and SFP56 cable assemblies supporting aggregate data rates of 100 and 200 Gbps, making them suited for data center equipment, test and measurement equipment, and wireless infrastructure devices. TE’s new QSFP56 and SFP56 high-speed cable assemblies comply with Ethernet 802.3cd and support 56G PAM-4 applications. The cable assemblies’ optimized construction minimizes insertion loss and cross talk, and the solutions are backward compatible with existing QSFP and SFP connectors and cages for easy upgrades. Paired with TE’s QSFP28 and SFP28 connectors and cages, the 56 Gbps QSFP56 and SFP56 cable assemblies offer a broad solution for connectivity between devices. “Our new SFP56 and QSFP56 cable assembly portfolio draws upon TE’s vast expertise in high-performance connectivity solutions to enable 100 and 200 gigabit speeds for next-generation communications equipment. Our broad product line helps ensure that TE is a one-stop source for connectivity products” said Jacob Paul, product manager in TE Connectivity’s data and devices business unit. Ekinops introduced its new PM 400FRS04-SF flexible rate line module. This new module triples the capacity of the company's 200G FlexRate solutions. The new module supports coherent line interfaces from 100 Gbps to 600 Gbps. 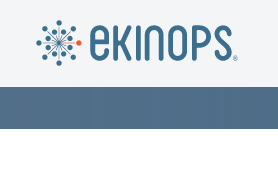 Ekinops said its new module provides six QSFP28 client ports aggregated to a software selectable line port that automatically configures the modulation format and baud rate to create the optimal transport link. By selecting the bit rate and distance, the PM 400FRS04-SF automatically tunes its performance based on the settings so it can support any application from very short reach, very high capacity data center interconnect to long haul and even submarine transport. It can be installed in any Ekinops 360 chassis allowing customers to upgrade their networks without having to replace their existing equipment. The PM 400FRS04-SF also offers support for single fiber transport. Bi-directional operation over a single fiber strand significantly reduces operational expense by allowing service providers to cut their fiber costs in half. The module will be commercially available in the first quarter of 2019. ColorChip contributed it's 200G QSFP56 FR4 2km transceiver to the Ethernet Alliance sponsored Higher Speed Networking Interoperability Plugfest event, held in the University of New Hampshire's Interoperability Lab (UNH-IOL) in Durham NH. In addition to the 200G QSFP56 FR4 transceiver, scheduled to be commercially available by Q2 2019, ColorChip also contributed to the plugfest its full family of 100G optical transceivers including 100G CWDM4 Lite, CWDM4 and 4WDM-10 transceivers which have already supported hundreds of thousands of deployments in mega-datacenters, covering applications from 500m to 10km. "The Higher Speed Networking plugfest aimed to improve the interoperability of the Ethernet ecosystem at port data rates from 25Gb/s through 400Gb/s," commented Dave Chalupsky, plugfest Chair and Board member, Ethernet Alliance, and network product architect, Intel Corporation. "The testing matrix included PHY's, NIC's, switches, test equipment, as well as optical and copper media types, provided by members of the Ethernet Alliance and 100G Lambda Multisource Agreement Group." Viavi Solutions introduced a significant enhancement of Network Performance Management and Diagnostics platform. Viavi's Observer GigaFlow stitches together user, network, and infrastructure data into a single record. This delivers high-fidelity forensic visibility into network conversations over time, as well as service path visibility for problem domain isolation across a complex hybrid IT environment. MetroNet Fiber Inc., which provides fiber-based Internet, TV and phone service in more than 50 cities in Indiana, Illinois and Kentucky, agreed to acquire LightSpeed Fiber Communications, a Michigan-based fiber-optic Internet company serving Lansing, Grand Rapids, Southfield, Huntington Woods and Ypsilanti. LightSpeed also operates a 2,400-mile U.S. fiber optic backbone, spanning from Chicago to Atlanta to Washington DC. This acquisition will allow MetroNet to access LightSpeed’s already laid framework of fiber-optic cable in these areas and optimize these markets to receive MetroNet’s 1 Gigabit speed or higher. Financial terms were not disclosed. Chile's telecommunications regulator has launched a market consultation and study to assess the feasibility of direct subsea cable system from South America to Asia. Current connections are routed either via the United States or Europe. Chile's President, Sebastián Piñera, has expressed his support for the study. The Industrial Internet Consortium (IIC) and the OpenFog Consortium (OpenFog) have been combined into one organization focused on Industrial IoT, fog and edge computing.